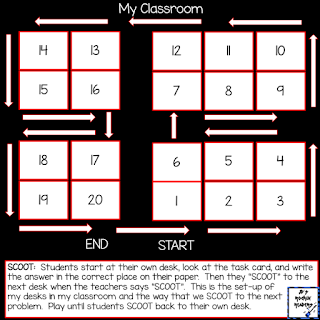 Do you play the game of SCOOT in your classroom? I have heard different conflicting reviews about the game of SCOOT. Personally, I LOVE it (but only after the first couple of times of playing)! 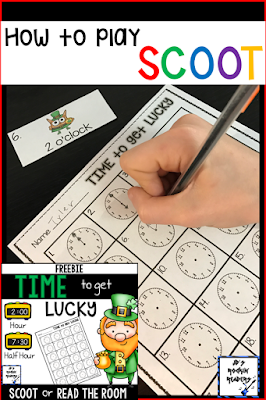 The first couple of times I play SCOOT with my students (first graders), it is nothing short of torture... it's true. Then, after a couple of times, it suddenly becomes MAGICAL (minus the two kids who still have no idea what we are doing). Here is a diagram of my classroom set-up and how we SCOOT around the room. Students start at their own desk. They look at their "task card" that is on their desk. They write the answer in the correct place on their paper. When the teachers says "SCOOT", students will SCOOT to the next desk. They only take their paper and pencil with them. The task card stays on the desk. The diagram shows the way the kids rotate around the room. 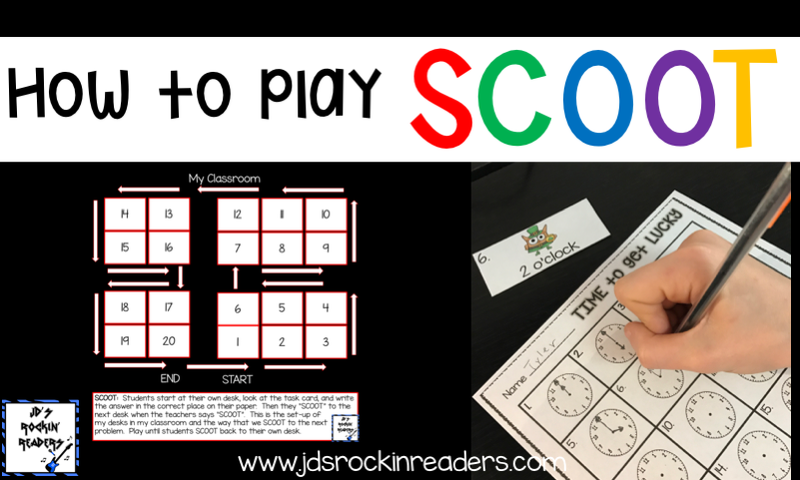 Once they learn the way to rotation (after about 2 times of practicing), they are good to go and can knock out a game of SCOOT in about 10-15 minutes. WARNING: The first time you play will seriously take you about 30 minutes! No joke- it's awful, but I promise it gets better. 1. The kids are up and moving. 2. It's very easy to see who is grasping whatever concept we are reviewing and who is having difficulty. 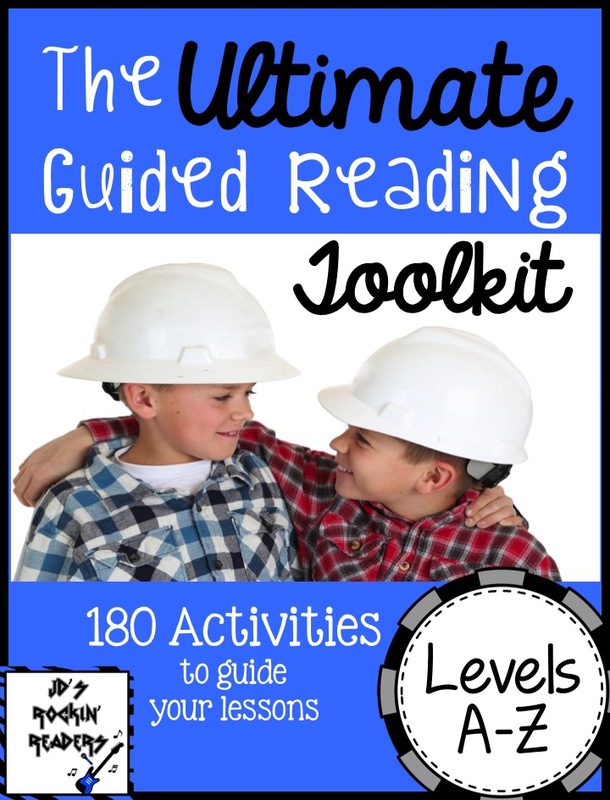 It's a great Formative Assessment! 3. The kids love it! There is usually one little tweak that I have to make to the recording pages when I use a SCOOT game. Of course we all have a different number of students in our class. Recording sheets vary in the number of "task" there are in the product. For example, I have a FREEBIE to share with you. I made the recording page to have 24 different "tasks". I only have 20 students so I simply cross off the last four boxes (21-24) and then I make copies. 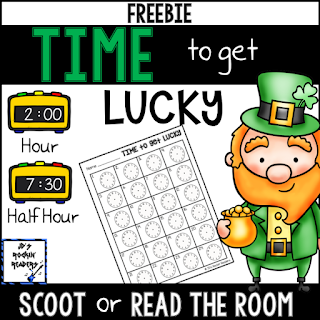 What you see here is a FREEBIE SCOOT game! It has a little St. Patrick's Day theme. The students have to draw the hands of the clock onto the paper. I realize this isn't a skill that we typically do when telling time. However, I have found that it really gets the kids thinking about the hour hand (short hand) and the minute hand (long hand). I stress how important it is to make sure that I can tell the difference. These pictures show time to the hour but this product can be used for time to the half hour OR a mixture of the two! Click on any of the pictures to take you to this FREEBIE! Here is another way I use Scoot. 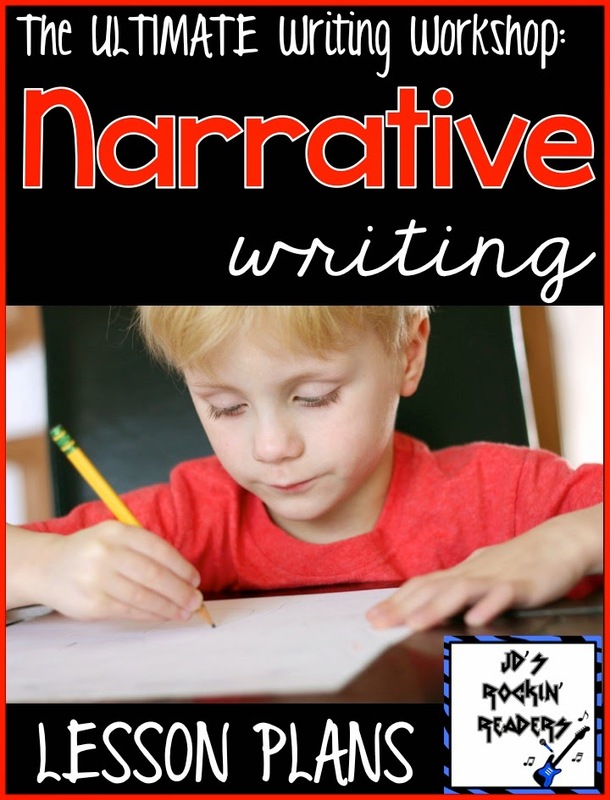 I assign half the class as "sitters" who have sheet skill words or sentences. The other half are "scooters". First the sitters find a place in the room to sit. Then I send out the "scooters". The partners then practice the skill given to the sitter. After a few minutes. I say scoot and the scooters scoot to another sitter to practice the skill sheet they have been given. Lots of engagement and skill practice.